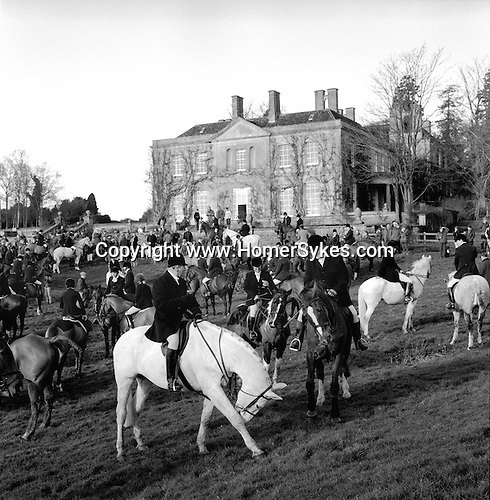 The Duke of Beauforts Hunt...The meet at Easton Grey House. Easton Grey, Wiltshire. It was at Easton Grey that the former Prince of Wales planted an oak tree to commemorate the time he spent there enjoying the 1922-23 hunting season. The present Prince, the Princes, and their family friends still hunt with the Beaufort. ...Hunting with Hounds / Mansion Editions (isbn 0-9542233-1-4) copyright Homer Sykes. +44 (0) 20-8542-7083. < www.mansioneditions.com >.